How can we create awareness of our scene throughout the year? What can we bring to the city that you would like to see? Dream big! How can we make FLOURISH 2019 the best yet? How can we involve more people locally? We will also be taking volunteer applications for both the festival and pre-festival fun: this means fun time for you and a free pass and new friends and you can brag about all of the cool stuff you are bringing to the city. Do you have unique and innovative ideas for craft workshops? edVentures Fredericton would be happy to hear about them and eager to promote them! Fredericton Tourism is currently accepting applications to instruct during the 11th year of edVentures: Learning Vacations in Craft and Culture. The 2019 program will run from July 6-21. Full-day (9am-4pm) workshops that range from 1-5 days in length will be considered. We encourage all instructors to offer distinctive workshops that are only offered during edVentures (i.e. not offered on a regular basis outside of the program). Please contact April.Thorne@Fredericton.ca for an application. All applications must be submitted by October 19, 2018. Addiction and Mental Health Services Fredericton, Horizon Health Network, is pleased to issue a Call to Artists to participate in the 6th annual Recovery Art Show, an exhibition highlighting recovery from addiction and mental illness. Creativity and artistic expression can play an important role in recovery. The purpose of this exhibit is to show art depicting people’s experience of recovery, increase public awareness, spark discussion, teach and change perceptions. The show will be exhibited at the Fredericton Public Library, November 1-29, 2018. Works in all media, of any size and completed in any year will be considered. Application deadline is October 12, 2018. Please contact nancy.morin2@gnb.ca to request a submission form or for further information. Galerie Sans Nom: Help out! Find cool things! We’ll admit it : our storage space is a mess. Keep an eye on our socials the week of October 1st. 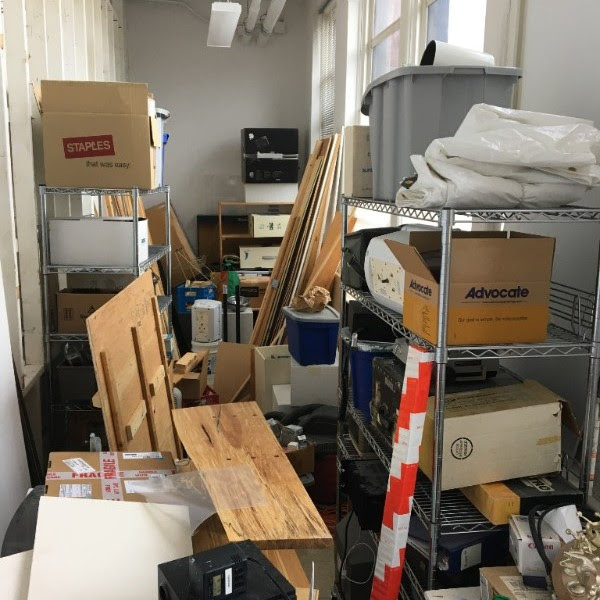 We’ll invite you to come help us clean out this mysterious space : wether it’s by sorting nails & screws or by taking home any of our giveaway items. Pay what you can or pay nothing at all : we just want it gone! On va l’avouer : La remise fait dure. La semaine du 1er octobre, restez à l’affut. Nous vous inviterons à nous aider à remettre la remise de la GSN en ordre : en triant des clous ou en apportant des «gugusses» chez vous! Une genre de vente à débarras où tout est à vendre pour ce que vous pouvez donner – même si c’est rien! From September 29 to October 11, Connexion will host Alexis Bulman with the project Bound Between Seasons. Alexis is looking for community members, particularly in downtown Fredericton, to contribute objects stored on their property to this project. The Committee acts in an advisory capacity to Council on various arts and culture projects and initiatives. It is comprised of 10 to 15 members and one member of Council. Members are appointed based on their backgrounds, knowledge and expertise in various areas of the local arts and cultural community including: arts organizations, performing arts venues and presenters, festivals, visual arts, galleries, artists of any discipline, public art, business and economic development, arts and education institutions, First Nations, Francophone cultural community, multicultural community, heritage organizations, museums, libraries, youth and seniors. Members are appointed for a three-year term, subject to possible re-appointment and are required to attend meetings held every two months or on an as-needed basis. In addition, members may occasionally be asked to serve on a project-specific sub-committee related to cultural projects of the City. These are volunteer positions and, as such, no remuneration is provided. Teachers or artists can propose programs that would bring an artist to work in a school with a class of students for an extended period. Normally the projects would run from 15 to 25 hours. Artists can be from any discipline – visual art, music, writing, drama or more. The artists will be paid $600 per project. The FAA will also cover the cost of approved materials. Previous projects have included puppetry, mural painting, musical theatre, art history, sculpture, an exploration of the use of wool through the years, and more. The successful applications will be for programs to run in the fall. If artists have a great idea, the FAA can work to find a school that would appreciate the project, and if a school has an idea, we can try to find an artist to carry it out. Full details and application forms are on the FAA website: frederictonartsalliance.ca. The Estey Art Initiative is a not-for-profit after school art program that is looking for teachers in Saint John. The ideal candidate is an artist or creative person who has a few hours to spare each week. They Estey Art Initiative employs a team of professional artists who inspire and teach aspiring artists of all ages. Those interested in auditioning are asked to show up for one of the audition dates; no appointment is necessary. Elf – The Musical is part of the SJTC 2018-2019 Main Stage Series at Imperial Theatre. The holiday favourite follows the story of Buddy, a young orphan, who mistakenly crawls into Santa’s bag of gifts and is transported to the North Pole. The would-be elf is raised, unaware that he is actually a human until his enormous size and poor toy-making abilities cause him to face the truth. Elf – The Musical will be staged at Imperial Theatre and will run from November 21-25, 2018. The show will be directed by Jennifer Mabey. Local artists will create music and birdhouses in the Garrison District Aug. 20 to 27. Musician Alex Good and multidisciplinary artist Chelsea MacCormack will create their art in Casemate #11 of the Soldiers’ Barracks. MacCormack, who uses natural building materials, will continue working on installations of birdhouses from the previous week, created using traditional materials such as birch bark, spruce root, and natural stains and oxides. She will link the birdhouses together using a continuous painting of the river. Good, who has composed film scores for Maritime-based productions such as P.O.V., Owl River Runners, and We Ae Characters Incorporated, will create a musical montage inspired by the river’s impact on Wolastoq, Anglophone, and Francophone cultures. The artist residencies, organized by the Fredericton Arts Alliance, encourage visitors to interact with the artists. The studio is open 10 a.m. to 5 p.m. Monday through Saturday and noon to 5 p.m. Sunday. THIRD SHIFT is a growing project and labour of love. Each year we rely on our volunteers’ generosity to bring it all together. Volunteering is an amazing way to meet new people, participate behind the scenes and learn about the art projects in-depth. We’re now looking for reliable individuals to join the team. Contact our associate, Ashton at thirdshiftassociate@gmail.com for more information or to sign up! SAINT JOHN, NB – August 9, 2018 – One of Saint John’s best known local retailers continues to be a success now under new ownership. As of August 1st, Handworks Gallery is under the new ownership of Elizabeth Cook. An artist herself, she came to the gallery with years of experience from Gainsborough Galleries in Calgary, Alberta. Originally from Southern New Brunswick she was anxious to come back home and have the opportunity to work with artisans from her home province. “Elizabeth has been part of the Handworks family for over a year now and I can think of no other person to move this gallery forward and continue to grow its reputation as the premier outlet for fine art, jewellery, pottery, woodwork, glass and sculpture,” said Oland. At the time of its closing back in 2014, many artisans were owed substantial sums of money from the previous owners. However, a promise was made by Oland to cover the debts of artists who continued to do business with the gallery. “It was a show of good faith to the local arts and crafts community members who continued to sell their work at the gallery,” said Oland. Elizabeth Cook added it is her intention to build upon Handworks Gallery’s reputation and to draw from her own experience from Western Canada. “I believe in our Maritime artisans and what they have to offer and I look forward to providing our customers with a wide range of one-of-a-kind works,” she said. Oland and Cook released the news to their artists last Friday, August 3rd, to ensure a smooth transition. “We have been receiving a huge amount of support from the artists. Working with them for the past year and building that relationship has made the switch very natural,” said Cook. We are inviting filmmakers from across the province to come to Fredericton to participate in this festival. We hope to have even more groups come out this year to celebrate our New Brunswick film community, and this is where you are important to our festival. We ask that you tell your art and filmmaking community about our competition, as we hope to have as many films submitted as possible. For more information and updates, check out our Facebook page (https://www.facebook.com/fred48film/). In the upcoming weeks, we will be sharing more information about how and where to register for the festival. We also have opportunities for people who would like to participate in the festival but do not have a full group to also join other groups so they do not miss out on the experience. Participating in this festival is a perfect way to make connections within our entire New Brunswick filmmaking community! – keep it simple and have fun! Submit up to eight poems, or one short story (maximum 5,000 words) at a time. Whether you’ve never published before, or you’ve published seven novels, we’re looking for the same thing: compelling characters, plots that surprise us, narratives that move us, stories that have something new to say. We love poems that are lyrical without being overwrought and are profound without being pretentious. We look for the honesty of emotion, and images that are. This project is open to artists who speak English or French, but the selected per- son must be able to speak, read and understand French. Applications may be submitted in either of the official languages. Le Centre d’artistes la Constellation bleue gestionnaire de la Galerie Bernard-Jean de Caraquet en collaboration avec le Ministère du Tourisme du Patrimoine et Culture du Nouveau-Brunswick organise une résidence d’artiste pour l’automne 2018. Un – une artiste professionnelle en arts visuels du NB est invitée pour deux semaines à résider dans la région de Caraquet NB. Les artistes de toutes les communautés sont invités. L’air du temps est une résidence qui porte sur l’idée de la rencontre. La rencontre et la découverte d’une communauté par un artiste. AX, the Arts and Culture Centre of Sussex, is accepting workshop proposals in Fine Art, Fine Craft, Writing, Music, and the Creative Process for our fall session. If you’re a professional artist and would like to teach workshops at AX this fall, for any age or experience level, please submit your proposal by August 13 to info@axartscentre.ca. Questions? Download our AX Workshop Proposal or contact us for more information. The Arts Infrastructure Grants for Emerging Artists program is a project-based program designed to provide one-time capital acquisition to emerging New Brunswick artists to acquire equipment that will enable them to complete a project and strengthen their long-term artistic development. APPLY ONLINE: Click here to submit your grant application online. Rene Collins, The Knife Painter, a beloved Saint John artist known for her breathtaking and textural oil paintings, distinctly recognizable by her signature technique of using only palette knives. In this special show, Pamela and James Mullinger from The Maritime Edit will be joining Handworks Gallery as we celebrate Rene Collins and her newest collection of works, featuring her brilliant red paint trademark. Exploring themes of Maritime coastlines, moody boat scenes and vibrant poppies and wildflowers, Rene has been building a show that captures her most identifiable subjects. “My painting takes me to another place. Here, there is no concept of time ..hours turn to minutes ..stress is left at the door and the pain of standing for hours will not be felt until a later time. I have no need for social conversation. This is a time that belongs to me. It is probably the only selfish part of me. Every painting is a new journey: there is no end – only beginnings. The show opens on August 2nd, from 5-8pm. Kid friendly and open to the public, we invite everyone to join us for this special event. Handworks Gallery, established in 1990, is located at 12 King St. Saint John, NB and represents over 90 artists in fine art, fine craft and fine jewellery. You can visit the gallery’s online store at www.handworks.ca. grading and colour theory using DaVinci Resolve. videos to work on a 3.0 USB external hard drive. Canada flights as part of the Images Festivals Stitches in Time. Contact milada@trinitysquarevideo.com or 416-593-1332 to register. Interns, our Donors, Volunteers and Members.